From now on, every Friday is link-roundup-post day. Why? Because I’m a fan of aggregation and because I need to justify my bloating-by-the-day blogroll (check it out, to your bottom left). Share your own favorites from the week in the comments, even if they’re your own! Get Energy Smart Now lauded the University of Minnesota Solar Decathlon team for the technology, beauty and efficiency of its ICON Solar House. The post also pointed out that each college competitor in the Solar Decathlon faced the challenge of designing for year-round living. But after seeing some of the stuff teams from warmer climates can do with their designs in this Washington Post video taken at the competition site on the Washington Mall, it’s clear the Gophers didn’t exactly have a leg up, climate-wise. 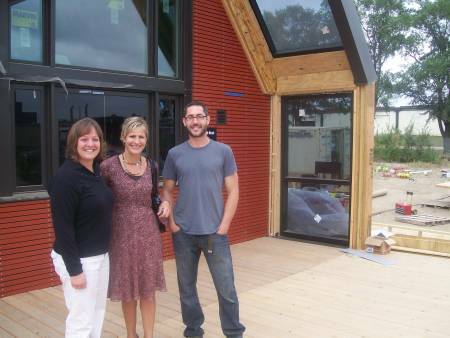 Mary Stage (Web administrator) and Carla Warner (director of sales) pose with Dan Handeen outside the U of M's Icon Solar House. We visited the ICONic house last month and can’t wait to see how the team scores. Opening ceremonies began today … good luck! From the annals of um, interesting appliance ideas comes this psychedelic Westinghouse video from the ’60s. Don’t be fooled by the introduction — it picks up. Watchng the entire 6 minutes isn’t a waste of time, either. Westinghouse shows how you can match your fridge to your parties (hello, Fourth of July finish! ), your apparel and how you can dance the entire time. The kids I used to babysit for had the cutest decorative decals in their rooms and bathroom (Mom was smart enough not to paint flowers and cartoon cars on the walls or force the kids to resort to Crayola murals.) 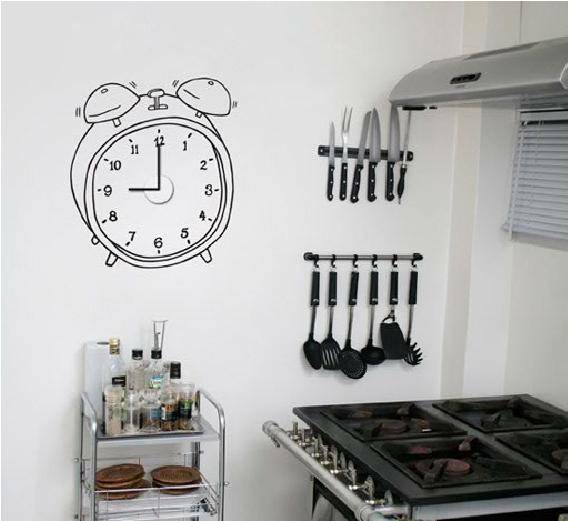 As someone living with concrete walls, I wanted something like this to be able to dress up my room. Where do you stick ‘em? On the walls, tiles, appliances, windows, furniture, or? I’d like to try some inside the glass doors of my china cabinet, perhaps full lace sheets that are very subtle so that I can stuff more in the cabinet without anyone seeing inside. Admittedly, the idea of putting decals on appliances is a little Westinghouse circa 1960 (see above video), but enticing nonetheless. I’ve been thoroughly enjoying certified kitchen designer Susan Serra‘s guest posts all over the web this week. She included this picture, with an unexpected pop of warmth from a range, in her post, “A Pinch of Sugar Color,” on The Kitchn. 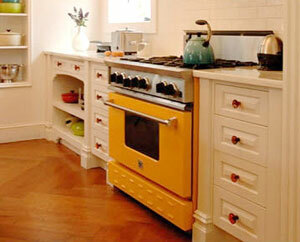 For permanent installations, colored appliances have rapidly increased in sales in recent years. One look I’d be careful of is the “suite” of appliances, all the same color, say, blue or red. If one key appliance, depending on its location — let’s say the range — is a color, the impact will be far more interesting as a design statement. She’s completely right and makes me question some of the “suites” I featured in my own post on color. Clearly, I’m no designer! KARE 11 this week did a story on Remodeling Magazine’s Cost vs. Value report, which determined which remodeling projects deliver the most value in resale by city. Numbers don’t lie, but KARE interviewed local remodelers for the story whose perspectives on the best-bang-for-your-buck projects offer context to the data. Loved the video, loved the dancing. I’m going to show my daughters so they can add some dance moves to their repertoire. I thought the beginning was rather odd? Great music though; it reminded me of the old Mission Impossible theme song. Very strange, right? I wonder if there are more like it.